View the slide show of Gerard Brown's Alpine Trial photographs. Look back on the 1st Alpine Trial in the video below. 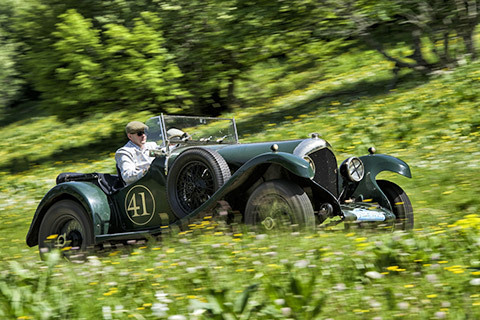 The final day proved to be an intense, nail biting, suspense-filled drama as crews tackled four Regularity time trials and an "Alpine Section" as well as finding time for a long lunch, in what proved to be an action-packed day in our westwards circuit out of Annecy. We touched the southern end of the Jura mountains and took in some of the fabled mountain climbs from the pages of rally history. For the front runners, every second counted. Keith Baud suffered an attack of nostalgia in the route planning, scheming in a timed run over the little known Col de Biche, which proved treacherous on our Monte Carlo Challenge, when snow and ice on this climb decimated the field and only two drivers managed to make the next time-control on time, Monty Karlan from Norway and seven times American rally champion John Buffum. Today was much more serene with dappled sunshine through the forest lining this challenging mountain climb. The results changed again during the day. Gareth Burnett and Jeremy Haylock in their Talbot 105 kept it all together to only drop seven seconds all day, clinching the outright win, and also becoming the only crew in the event to qualify for an Alpine Cup. They kept a "clean sheet" of remaining penalty free at every Time Control - a remarkable achievement. Behind them Paul Carter finished second with Robert Ellis but the gap widened as the day wore on. Third went to Bill Cleyndert and Matt Abrey in the Ford Model A, but they took a wrong slot on a regularity, and came into lunch feeling depressed at having lost their two second lead over the 285bhp Alfa Romeo Zagato... but when Bill Ainscough arrived, he admitted he too had missed a junction and lost time, so equilibrium was restored. What was a two second lead yesterday was now a gap of 56 seconds. Fourth was David Williams and Alan Smith in their Chevy Fangio Coupe and fifth William Medcalf and Tony Brooks in a Bentley Super Sports. Jean Steinhauser said, "I used to think the Rallye des Alpes was the best rally for us - but this has been better. It's been hard competition but this is what we will all remember, and Anne said she couldn't read maps. She started out worried... but can read a map now. It's been brilliant." Others were also full of praise for the demanding challenge. "It's been truly wonderful - a really fantastic driving experience" said William Medcalf, "three days with perfect organisation has delivered a fantastic experience." Vauxhall 30/98 driver Charlie Bishop's summing up spoke for many with: "A terrific three days, with a brilliant route and excellent back up - we are all itching for another." 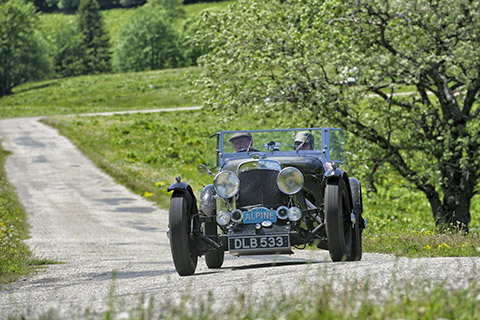 So, 80 years to the month that saw a Talbot 105 win the 1934 Alpine Trial in the hands of Mrs "Bill" Wisdom, a Talbot wins again, and in an event with the original 1934 winner out competing one more to finish 7th with Jon Ruston. Special awards went to Ludovic Bois for his driving of a Peugeot 402 saloon, collecting the Spirit of the Rally Award, the Against All Odds was presented to Peter Little for nursing a Bentley with no clutch, and James Gately from America won the Concours for his smartly presented Cadillac. 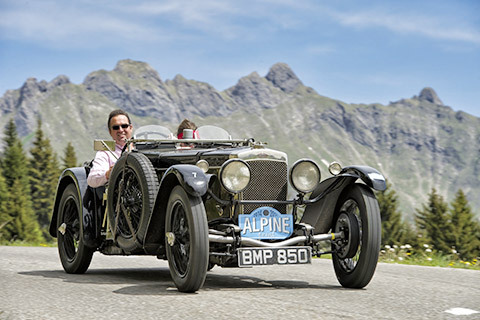 All the talk over the champagne dinner was of next year - and the 2nd Alpine Trial. A tale of two Bills, the scrap for seconds. A hard day's driving in glorious sunshine saw the competition intensify today with the rally heading South from Annecy into the Haute Alpes. The first climb of the day was up to the Semnoz Ridge, well known to cycling fans as this was the penultimate stage of the Tour de France last year... We will return to this terrific spot and it's glorious views tomorrow afternoon for our ceremonial finish. We then took a long run south into a little known mountain area known as the Massif de Bauges. Our first string of time-controls that make up an "Alpine Section" incorporated a network of lanes that crossed the Col de Marocaz, followed by a maze of narrow and twisting roads - placing a premium on handling, reliability and accurate navigation - through the Northern end of the Chaine de Belledronne, an impressive range of mountains overlooking Grenoble. There were several highlights of our day but particularly memorable was the super long climb from Albertville to a lunch stop in a remote chalet using a demanding and twisty road past the Fort du Mont. Even in a modern car this can take the best part of an hour, a truly wonderful spot of "hill climbing" with a day that just got better as it drove on, including the iconic Col du Pre that featured heavily in Alpine rallies in the 1950s and 1960s. The final test of the day was the the narrow Col de l'Arpettaz, which route designer Keith Baud reckons contains 57 hairpin bends. Results were ever changing today, with a new leader by the time we returned to the Imperial Palace Hotel. Bill Ainscough and Jason Dearden in their Alfa Romeo Zagato slipped from first to fourth, the Talbot 105 of Gareth Burnett and Jez Haylock is now our new leader, with Paul Carter's Bentley moving up to second 32 seconds adrift, and Bill Cleyndert and Matt Abrey hold third just six seconds from the Bentley. Bill Ainscough's Alfa is separated from Cleyndert's Model A Ford by just just two seconds... Right now Ainscough is wondering what he has to do to lift his exotic supercharged twin-cam Alfa past the side-valve old Ford Special, while Bill Cleyndert is wondering how he can increase his lead over the supercharged Alfa that is blessed with so much grunt it can spin its rear wheels in third gear. The noise these two make as they charge up a mountainside carries all the way to the next valley. Yesterday, Cleyndert was shell shocked when told he was up with the leaders. Today he kept up the pace, and with Matt Abrey on the maps is clearly determined to put one over the Alfa crew and narrow the gap on the second placed Bentley. Paul Carter meanwhile reckons the 32 second gap between himself and the leading Talbot can be narrowed. 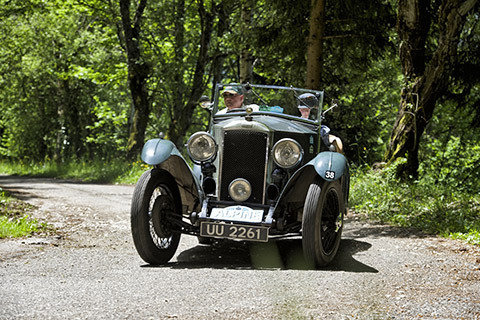 But today's challenging route was chiefly all about agility - and the Talbot was demonstrating the same qualities that made it such a successful rally winner in the 1930s. David Williams and Alan Smith are holding fifth in their Chevy, moving up a place, and William Medcalf and Tony Brooks are now sixth in their Bentley Super Sports. Less than three minutes separate the top six crews in what is turning out to be a highly competitive contest. We must correct the historical reference in yesterday's previous news report... 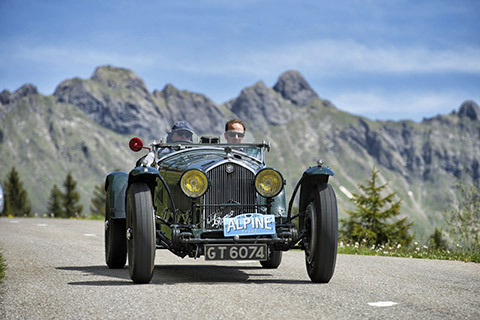 The winning car of the 1934 Alpine Trial, a works-Talbot 105, is the car currently being driven by John Ruston, who at the moment holds 7th. This car was originally driven by Mrs 'Bill' Wisdom, (her daughter navigated Pat Moss to Alpine Rally successes. Here's a thought: The Wisdoms must be the only family in rallying history to produce a mother and a daughter to win an international rally outright). The two Talbots in their vivid pea green factory colours look splendid carving their way up the cols on this event. We are dining on the terrace of the Imperial Palace Hotel Annecy, looking out over the manicured lakeside lawns to the snow capped mountains of the Mont Blanc Massif across the water. This is the perfect place to be with friends on a summer evening. The subject around the long tables amid all the banter and laughing comes back to one central topic - the first day's competition of the E.R.A. 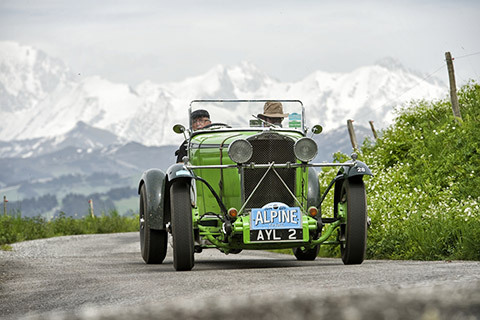 's 1st Alpine Trial. It's been a challenging day - that's the universal conclusion, with the format of the navigation centred on the beautifully prepared route-books with minimal Tulip diagrams, instead navigation throughout the day has been from bound copies of detailed French maps, with the route and all the checkpoints clearly marked. With timing to suit cars over 70 years old, and all on drum brakes, drivers and navigators had their work cut out. Tiny narrow roads that thread their way around the mountains of this region look easy on paper but when the clock is running hard against you, junctions and turnings requiring clear and instant decision making, become a tough call. The Col de Colombiere, Col de La Ramaz, and the Col de Joux Plane, are all twisty, demanding remote climbs - surprisingly traffic free - set in breathtaking scenery... and then it's on to lunch found in the wooden chalet at Lac de Montriond where Jane from the Rally Office was waiting and running the time-control - part of the small army of marshals who leap frog around the mountains stamping the time cards. There's been a healthy scrap at the top with four Regularity tests, a special Alpine Section of time-controls that pop up all too often, and two off-road special-tests - with all this lot timed to the second you could expect big gaps in the penalties on the leader-board. However the results showed a real fight with just the odd second dividing the leaders. Bill Ainscough and Jason Dearden, who swapped a chain drive Frazer-Nash at the last minute for a stunning Alfa Romeo 8C Zagato lead at the end of day one, one second ahead of Gareth Burnett's Talbot 105 - the very car that was here in 1934, when it won outright. Third is the hard charging Bill Cleyndert in his alloy bodied Ford Model A only two seconds behind the Talbot and just three seconds ahead of Paul Carter and Robert Ellis in their Derby Bentley. Peter Little in a Bentley, David Williams with Alan Smith in the Chevy Fangio Coupe and William Medcalf with Tony Brooks in the Bentley Super Sports that won the recent Flying Scotsman, and Mike Thompson and Julian Riley in a Bentley are all flying in close formation, John Jiggins and Steve Gipson chasing them hard in their Alvis. Smallest car, the 1250cc MG TC of Peter Zernial from Germany ends the first day in the top 20, holding 18th. (See the Day 1 Results for more). Mick Walsh from Classic & Sports Car in David Hescroft's A.C is 28th. The car was rallied by Betty Haig who stayed in this hotel, driving it in the 1946 Alpine Trial - David drove it on the first historic rallies in Britain, including the 1982 RAC golden Fifty and the Coronation Rally promoted by Philip Young in 1983. There were sadly several last minute retirements from the entry list. Peter Livanos reported a split fuel tank with his Zagato Alfa 8C so was a non-starter and Jonathan Turner was forced to scrap intentions to rally his Triumph Dolomite. Tomorrow battle commences with the second day of Keith Baud's remarkable route. Cars are gathering for the pre-start formalities of the 1st Alpine Trial. We’re staying in Annecy’s 5-star Imperial Hotel on the shores of Lake Annecy which celebrated its 100th anniversary yesterday. This grand old hotel has seen a lot of events in its lifetime, including the original Alpine Trial of the 1930s. 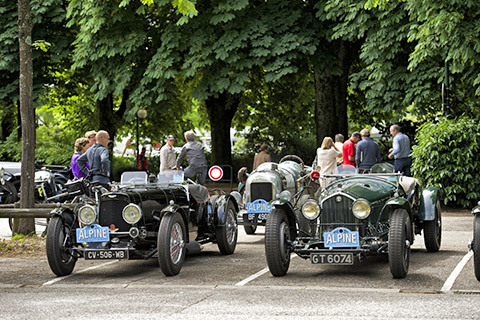 The Vintage cars for the 2014 are lining up in the dappled sunshine under the trees of the car park outside, just like they did for the original events. The hotel however is not the only authentic aspect to this unique event - the route, the cars and the places, all hark back to the original route-notes of the early days. The timing system is also different from how things are done in the UK and experienced crews and novices alike are having to get to grips with Keith Baud’s innovations - invariably the devil is in the detail and there is a lot of this detail for the navigators in particular to get to grips with in the hours before the start. The afternoon belongs to the team of scrutineers who are checking the safety and technical specifications of the cars, before a drivers briefing on the terrace of the hotel later today. Various models from Bentley and Frazer Nash sit alongside two immaculate Peugeot 402s. A Vauxhall 30/98s and an Aston Martin are parked next to a pair Invictas just over the tarmac from a BMW 328. Chevrolet Coupes, an SS100 Jaguar and two immaculate Talbot 105’s are lined up next to them including the car that won the Alpine outright in 1934. Lancia, Rileys, MGs, even a big Cadillac have brought a remarkable variety to the entry-list. Ahead are three days of hectic mountaineering, starting first thing tomorrow morning.